The leaves are falling, the air is feeling crisp, and my alarm clock goes off when it is still dark out (ugh!). What does that mean? Thanksgiving is near! …Well, it is if you’re a Canadian. To get ready for the festivities, I have begun creating some scrumptious new recipes. 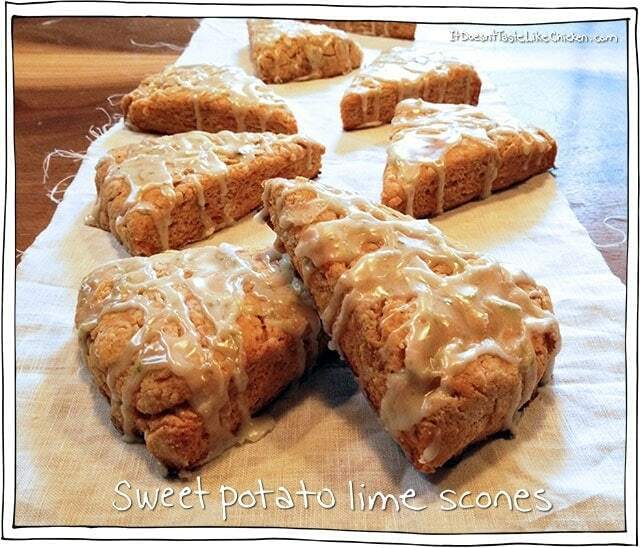 I started by whipping up these vegan Sweet Potato Lime Scones! …well when I say it like that, it sounds sooo easy. It was more like, “after stomping around the kitchen and throwing a hissy fit when my first batch failed miserably, (see photo below). Andrew rolled his eyes at me as he happily ate all my rejected scones, (again see photo below), and then, I finally made the scone I had been dreaming of”. Full of sweet potato falvour, a nice spiciness, topped with a sweet lime icing. Perfection! Start by boiling a pot of water. Peel your sweet potatoes, and cut into smaller pieces just so they will cook faster. When the water is boiling add the potatoes. Cook until the potatoes are soft (test with a fork). Drain the water, and then mash up with a potato masher. Don’t add any milk or butter! 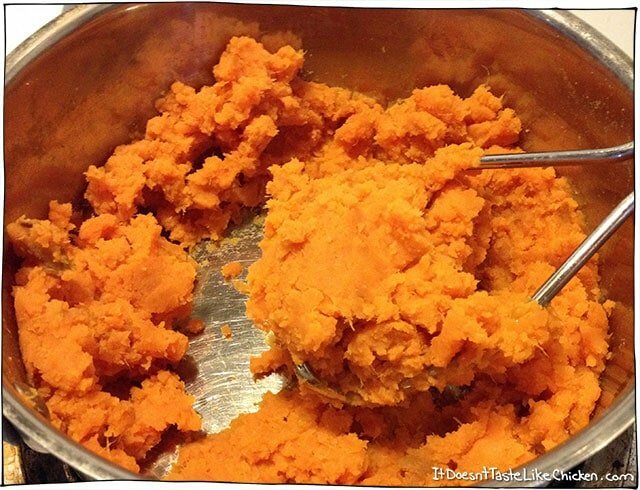 These aren’t aren’t for dinner, you want only pure mashed sweet potato. 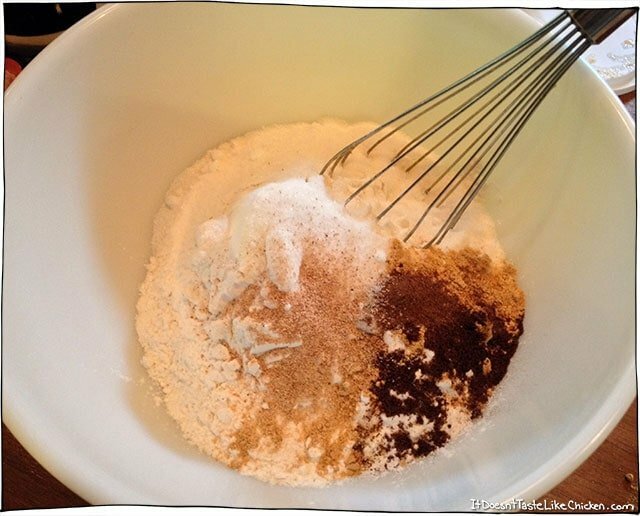 Preheat the oven to 425 F. Mix all the dry ingredients in a bowl (Sugar, flour, baking powder, nutmeg, ginger, allspice, ground cloves, and salt). Using a pastry cutter, cut the cold vegan butter into the dry ingredients, until it is crumbly. Next, add the sweet potato, and the vanilla, and use the pastry cutter to mix it in. Don’t over mix! Use your hands to gently form the dough into a ball. Lightly flour a clean surface, and gently pat the dough into a large circle, about an inch thick. This will make 8 BIG scones. 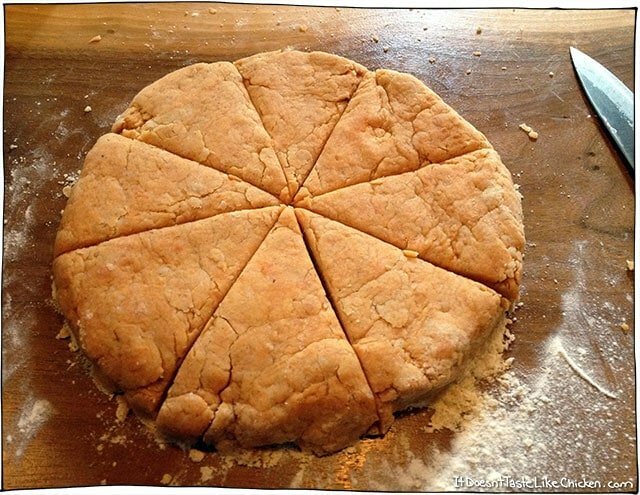 For smaller scones, divide the dough into two, and make two circles, about an inch thick. Lay the slices out on a tray and bake for 12-15 minutes. Check the bottoms to make sure they are done. 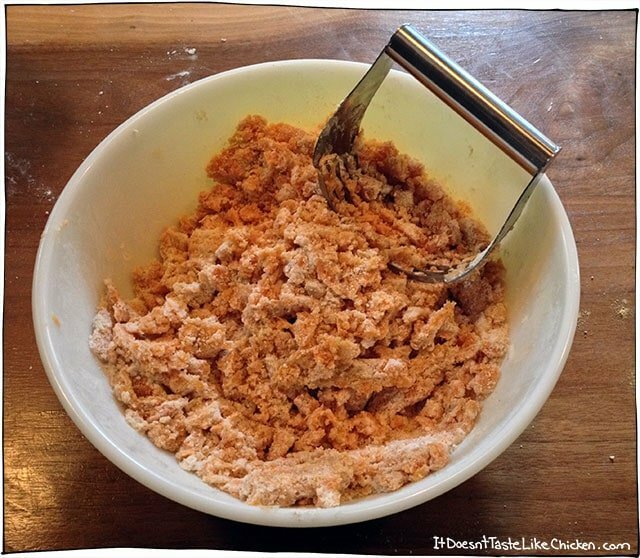 Once they are cool, make your icing by combining all the icing ingredients in a bowl. Drizzle over the cooled scones. Previous Post: « 10 Things You Didn’t Know About Vegans. I’ve tried making these twice, and they taste great! However, I tend to have a lot of excess flour when I make them, even though I am following your exact specifications. What would you recommend to correct this issue? I thought about adding the flour last. Do you think that would help? So happy you enjoy them! This is one of my very early recipes on this blog, so I am afraid I was not quite as good a recipe testing at the time. I would try reducing the amount of flour to abou 2 1/2 cups, and adding more if needed. Hope that helps! Hi – I have made these twice and they are delicious! Hi- I have made these twice and they are delicious and my family likes them also- great recipe! Hi Sam, through pinterest came to your website. Thank you for sharing so many yummy recipes. I just made the granola bars today, they are still in my freeze haha. 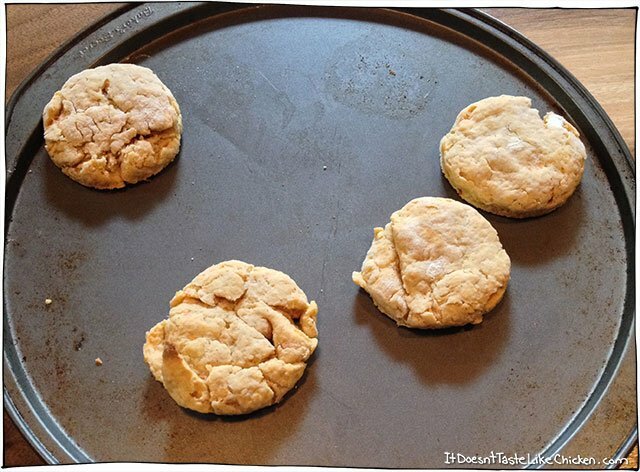 I have a question concerning the recipe for this sweet potato scones, in the ingredients you repeated the two cups of sweet potatoes. Do you need 2 or 4 cups in this recipes? I can’t wait to make this for the students that I meet up on Wednesday on campus. Thank you again! Oops, thanks for pointing that out, it is a little confusing isn’t it! Just two cups of sweet potato is all you need. Enjoy! Success! These scones are quick and easy to make. And I usually have all the ingredients in my pantry! The amount of flour seemed like too much but I contacted Sam and she eased my worries. The proportions are perfect! I unfortunately forgot to add vanilla into the batter so instead of water in the icing, i used the same amount of caramel liqueur. 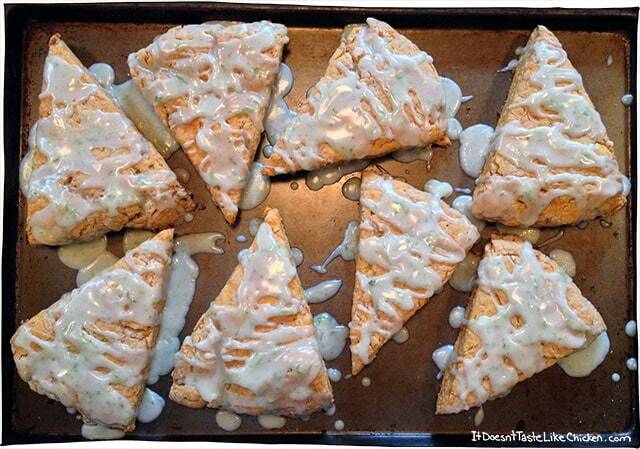 The icing really makes these scones! I’m happy that there really isn’t that much sugar added into the batter. I can pretend they’re healthy! I just ate 2 and I’m stuffed. Thanks again, Sam! It looks scrumptious! I would definitely be trying this recipe tomorrow and let you know. I hope they turns out well for you! Let me know how it goes. 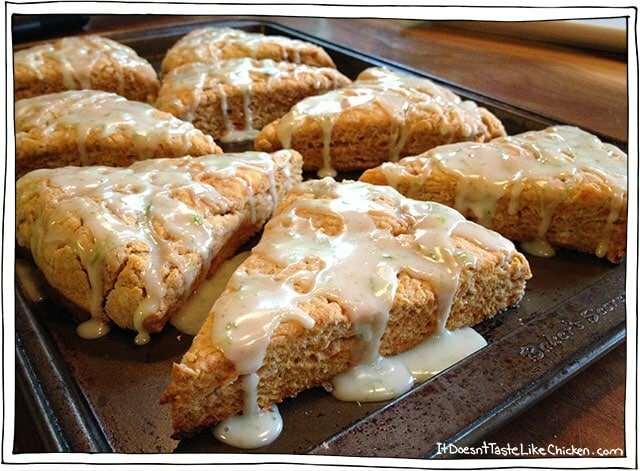 These scones look/sound amazing! 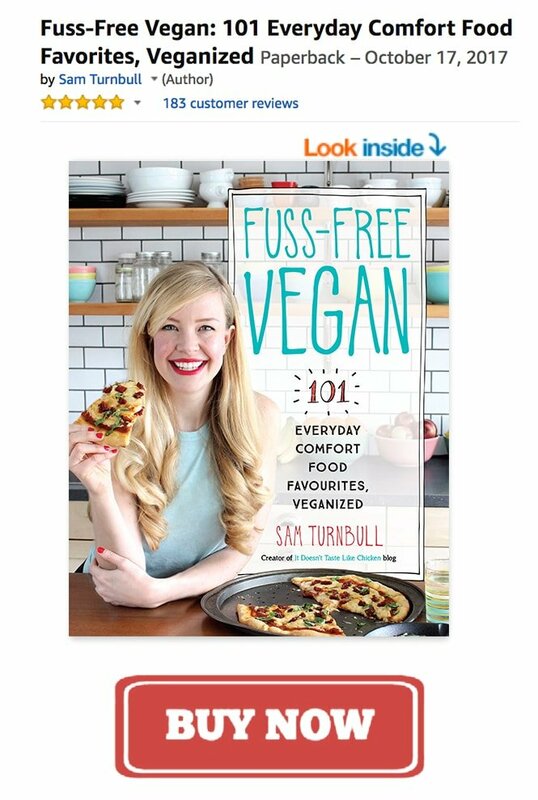 I’ve been looking for an easy vegan scone recipe and I think this will do the trick. When I make them, Ill blog about it and will give you a shoutout. Thanks!